It's also equipped with Wi-Fi for wireless communication to your smartphone or computer. So you can see the image preview, adjust camera settings, and record and stop the camera or remotely snap still photos, even while the camera is filming. VIRB uses ANT+™ wireless connectivity so you can use a compatible Garmin device, such as fēnix, Oregon and Edge, as remote controls. And because it has Wi-Fi, you can stop and start recording or take still images wirelessly with your smart phone or compatible Garmin device so you don’t have to take your hands off the handlebars or remove the camera from the mount for that perfect shot. 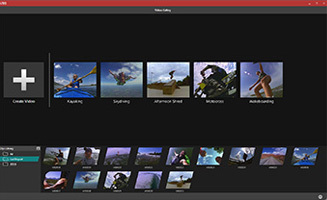 VIRB Edit is free desktop editing software that you can download to your computer for intuitive, robust video editing that takes advantage of VIRB Elite's compatibility with external and built-in sensors and other Garmin devices. Include your speed and heart rate on your motorcycle video, or accelerometer and altitude on your sky dive video. Once you have the video you want to share, upload it for all your friends to see.